Procter Gamble stock has long been a staple of many a dividend investor. And I too have been a long time holder of Procter and Gamble stock. In addition, we use a number of Procter and Gamble (also known as P&G for short) products around the Mr. and Mrs. DD household. So let’s air out this dividend King’s dirty laundry and run Procter and Gamble stock through a dividend deep dive. P&G classifies its products into ten categories. I’m going to name the categories and for my personal interest identify what products we purchase on a regular basis. We use Tide to do our laundry. Cascade goes in our dishwasher. And when we hand wash the dirty dishes, we use Dawn. And those Mr. Clean Magic erasures come in pretty handy. I scrubbed every wall with them when we cleaned up our house to sell it a couple years ago. Having no kids, we haven’t participated in this category. Mrs. DD threatened to put diapers on me if I didn’t grow up. And then I threw a tantrum and got my way! This category is too personal. No comment. This includes Bounty paper towels, Charmin toilet paper and Puffs Kleenex. We buy other brands in this category. These are commodities to us and we purchase cheaper alternatives. I take Vicks NyQuil when I get a cold. And if it gets really bad I will smear Vicks VapoRub all over my body before I go to bed. This is when Mrs. DD sleeps in the guest bedroom! We use alternative products in this category for toothpaste, mouth wash and the like. I use Gillette razors. They are pretty expensive. Maybe I should stop shaving to save money? There is no usage by us in this category. At the rate I’m going I won’t need hair care products in few years anyway. I’m just kidding. I have plenty of hair on my head. Not much usage in this category either. I know I have used Ivory soap at some point. But I’m not brand loyal on bar soap. Mrs. DD uses a lot of skin moisturizer, but she uses other brands for the most part. So there you have it. I hope you enjoyed snooping around our cabinets and closets for P&G products. Now let’s get back to the Procter and Gamble stock analysis. And of course, we will take a close look at the Procter and Gamble stock dividend in the process. Procter and Gamble stock pays a forward dividend of $2.86 per share. At the recent PG stock price this gives us 2.9% dividend yield. Trading on the New York Stock Exchange, the Procter and Gamble stock symbol is PG. Dividend growth has been pretty low in recently. In contrast, one of the attractive qualities of the Procter and Gamble stock dividend is its long history of growth. P&G is a dividend King having increased its annual dividend payment for 62 consecutive years. 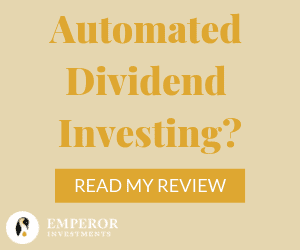 I love that as a dividend growth stock investor. But dividend growth has slowed, because of declining revenues and stagnant earnings. Let’s dig into these business fundamentals to understand them better. Revenue has been on the decline. This is due to a major restructuring the company started in 2014. The company decided to sell off more than 100 brands to accelerate growth. 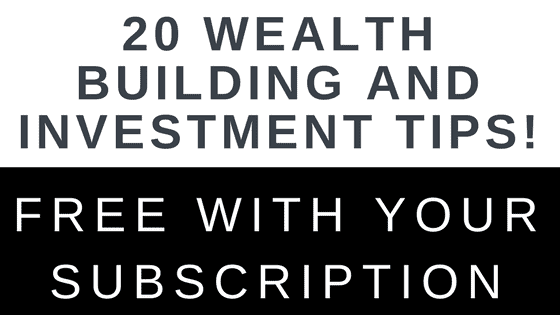 I used their strategy shift as a case study for a business planning course I taught in 2014. I still have the Wall Street Journal article I used in class that outlined their announcement at that time. They didn’t identify any of their brands to be sold during their initial announcement. However, they said they represented about $8 billion per year in revenue. And that approximates the revenue drop the company has experienced since 2014. More than 40 beauty brands were sold to Coty. And the Duracell battery brand was sold to Berkshire Hathaway just to name a couple of the divestitures. 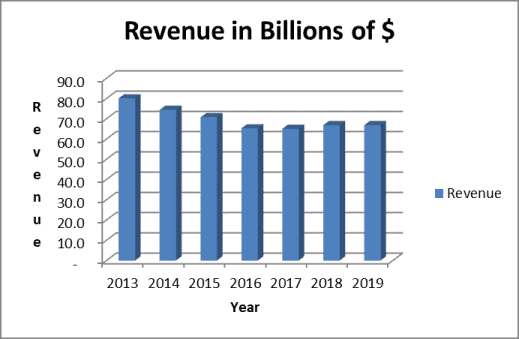 With their strategic repositioning mostly completed, it appears revenues have now stabilized in the $65 to $66 billion range. Accounting earnings are really choppy. Gains and losses on the sales of their brands as well as one time impacts from the 2017 tax reform act make accounting earnings per share tough to judge. In fact, the spike in earnings in 2017 was from a one-time gain on the sale of the beauty brands to Coty. 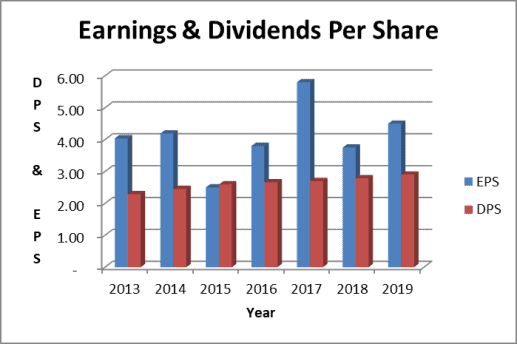 Two things that we can take away from the chart are that dividends per share grow steadily. And earnings per share usually cover those dividends by a good margin. It should be noted too, that P&G has taken on an aggressive cost reduction program since 2012. As a result, the company estimates it has reduced expenses by more than $3 billion. The cost reduction program has provided underlying support for earnings. 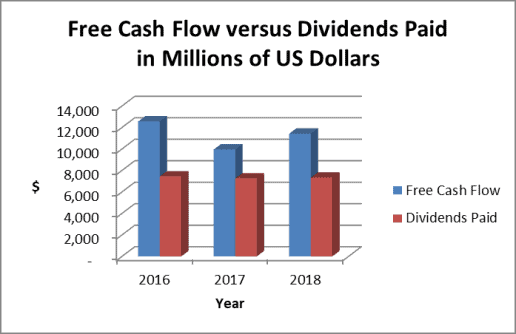 Since earnings are so volatile let’s look at how dividend payments stack up against Procter and Gamble’s free cash flow. Cash is cash. A company can-not manipulate its cash flows. And cash is not impacted by accounting rules. I always tell my accounting students that if I could only have one financial statement from a company I would choose their statement of cash flows. From my perspective, it tells me the most about a company’s past performance. The chart above shows us that P&G has been using about two thirds of their free cash flow over the past three years to pay dividends. For such a stable company, selling consumer staple products that have consistent demand, this is a very comfortable level to me. I judge the dividend as very safe. The company has a very strong balance sheet. Moody’s and S&P rate the company as “investment grade – very low credit risk”. This is a very strong evaluation. Furthermore, P&G has a low debt to equity ratio checking in at just .6 times. P&G’s credit rating and healthy balance sheet also tell me the dividend is very safe. Branded consumer products businesses have been facing major headwinds. Organic growth rates have been weak as consumers shift to lower cost private label products. And there is stiff competition from local brands in foreign markets. This takes time and money to understand cultural preferences of local consumers. On the expense side of the ledger, commodity price inflation and transportation cost increases must be dealt with. Finally, a stronger US dollar presents a threat because so much of P&G’s business is transacted in foreign currency. Procter and Gamble stock trades at 20 times projected 2019 earnings. This is not cheap. The stock was much cheaper in late 2018. It has since rallied more than 25% from its recent lows and is not as compelling of a buy right now. I still like Procter and Gamble stock at these levels. And with their strategic turnaround largely complete, I believe dividend growth will rise to the 5-7% level in coming years. As a P&G investor, the stock represents a nice combination of current dividend yield and potential dividend growth right now. It holds a large position in my dividend stock portfolio. And I would like to add to the position on any price weakness. I currently own Procter and Gamble stock. I own PG too and have for many years, thanks for the analysis. I hope the dividend grows faster too after this restructuring. 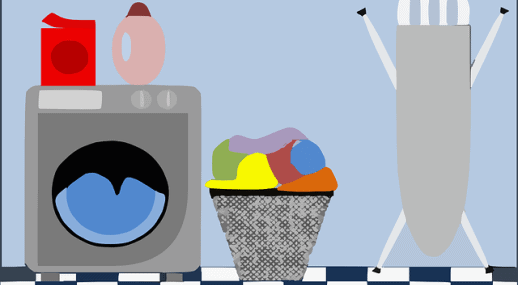 We use a lot of their cleaning and personal hygiene brands in our home and I suspect many other households do as well. I own them too. Like them but yeah they aint cheap at the moment. Id like to add more on the dips but as you pointed out grocery store brands are alot cheaper and lately they are getting my money. Makes you kinda wonder. Btw get a electric razor, they are the best. Hi Tom, that’s very impressive that P&G has increased its annual dividend payment for 62 consecutive years. Thanks a lot for describing their products. Actually I have been using a lot of them, too, but never realized many are from P&G, like the Dawn dish detergent, Bounty paper towel. That’s a company that is closely related to our daily lives. I too use P&G products. Though we have been shifting to store brands whenever possible, so long as we’re satisfied with the quality. Like you say, it’s important to see if this trend towards private label brands has long-term effects. Love the detailed analysis and for once, I don’t just use the products, I actually own the stock too! PG is a big name with an impressive dividend history. I also like consumer staples in general (because of the defensive nature). PG is a quality stock, no doubt about it. However I’m a bit concerned about their revenue development. I also feel that the valuation is too rich at the moment. I will consider investing, if we see better prices (like in 2018). Thanks for the detailed analysis! I liked how you went through your usage of P&G products. I don’t have a big loyalty to dishwasher soap- I do like Finish products, or the dishsoap. But I do get the Pampers diapers regularly (P&G product) I find they are the best for leakage and they seem to infuse a nice clean fresh baby smell into the diapers. My husband once commented “oh our boy is losing his baby smell” and I told him it was because he wasn’t wearing Pampers that day. Hah the power of brand loyalty!! Nice analysis Tom, and enjoyed the peek into your cabinets–you had me laughing with a few of those notes! I bought PG when building my portfolio last year and really wish I had been able to buy more at the time, as the stock is up over 30% from when I bought. I’ve been keeping my eye on them to add more, but would like to see the price a bit lower before I do. While I agree that some of their brands are being impacted by consumers shifting to cheaper brands, I also think there are some that people will buy no matter what given their habits and a feeling that they don’t want to skimp on those items. When I was using razors, I was also a Gillette customer but now I have a beard and use an electric trimmer to shave my head. We use quite a few of their branded products as well, and I’m happy to have PG in my portfolio. The stock looks good the way you presented it. However, I would still like to look at a few more accounting stats before moving forward and buying the stock. Especially, with the threat of an economic crash expected sometime soon. It must have been pretty scary to do this (as a company) back in 2014 but now it has started to pay off. To just give up 8 Billion per year in revenue must be scary. I have a some P&G stock as well and I’m thinking of getting more this year. What other companies would you say are a good investment in 2019?